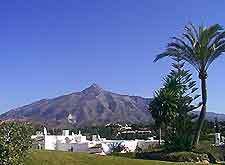 With a particularly scenic coastline and many top tourist attractions, Marbella is one of the Costa del Sol's most popular tourist resorts. Apart from Marbella's many sandy beaches and large selection of water sports, other notable tourist attractions in Marbella include cruises around the José Banús Port (Puerto Deportivo José Banús), and a scenic coastal boardwalk known locally as the Paseo Maritimo. 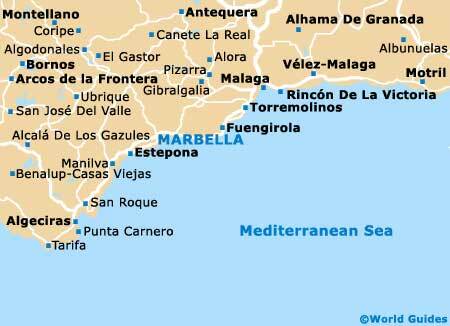 Further tourist attractions in Marbella include the Plaza de Los Naranjos - which is surrounded by historic buildings and structures, and the Plaza de Toros - Marbella's famous Bullring, where many seasonal events and fiestas are held. Marbella's famous boardwalk is more than 6 km / 10 miles long and stretches along the coastline and beachfront, with a white balustrade. Popular with both locals and visitors in Marbella, the boardwalk opens up the city and makes many of the main attractions and beaches easily accessible. The Paseo Maritimo also offers some superb coastal views, a number of coffee shops, cafés, restaurants and bars, seafront hotels and seating areas. 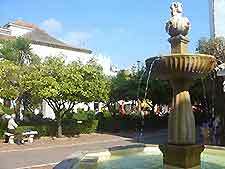 Situated in the centre of Marbella, Los Naranjos Square is a particularly appealing spot, being surrounded by a number of notable buildings and tourist attractions. With classical Renaissance-style architecture, the Plaza de Los Naranjos is an important part of local life and also features a historic fountain, a chapel dating back to the 1400s, the town hall (Ayuntamiento) and a number of nearby narrow streets and interesting shops. Regardless of whether or not you approve of bullfights, Marbella's Plaza de Toros is an impressive structure and piece of architecture in its own right. 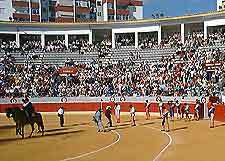 Seating around 10,000 spectators and hosting regular bullfights most weekends, the bullring is also used for many of the area's festivals and events, which include summer concerts. 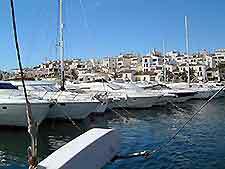 Banús Port is a popular marina in Marbella which was created relatively recently, during the late 1960s. Now a major tourist hotspot, attractions at the marina include pleasure boats, al fresco dining, speciality shops and a thriving nightlife. The José Banús Port is always busy and full of character, with waterfront walks and plentiful seating areas.